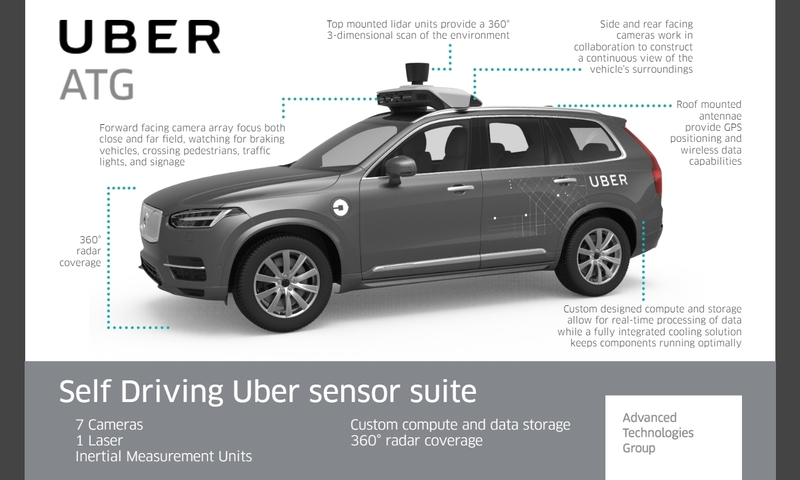 If you are requesting an Uber ride today in San Francisco, you may be getting one of the handful Volvo SUVs equipped with self-driving technologies. These are the Uber’s first self-driving cars that are being tested in the city of San Francisco. The vehicles are equipped with seven cameras, one laser, inertial measurement units, compute and data storage, and 360 degree radar coverage. Since the technologies are still in testing stages, each vehicle will have Uber engineers at the steering wheel ready to take over control at anytime. According to a report on techcrunch.com, once a passenger enters the vehicle, an iPad-based display system takes over Uber’s mobile app and begins to guide the rider to start the ride. The demo vehicle the reporter took handled well through areas with light traffic and open roads. But when it came to parts of the city with heavy traffic and construction, the vechicle had to be controlled by the on-board engineers frequently. The reporter admits that after the initial excitement wore off, the ride feels no different from any other Uber rides he has taken. A local radio station interviewed people on the streets of San Francisco. Most feel self-driving technologies are not yet ready and prefer human interactions for the time being. Other than mature technological advancements, the human mindset is one of the biggest challenges autonomous vehicle industry will face.